“My dad taught me how to read the Form when I was a kid. I’m from Kansas City, and once or twice a year, I’d go with him to Ak-sar-ben or Oaklawn. I went to college in Dallas, and I’d get to Oaklawn a couple of times of year. When I was the national correspondent for the Atlanta Constitution, I was on the road a lot. Some people play golf; I went to the track. I’ve been to over 100. What Drape’s brief Twitter profile doesn’t convey is the depth of his enthusiasm and affection for racing. He’s a horseplayer and he’s a journalist, and he’s also a fan, of the horses and the history and the stories at the track; each of these elements of Drape’s involvement with racing was evident in a recent conversation with him. Following a Brooklyn reading for his latest book, Our Boys: A Perfect Season on the Plains with the Smith Center Redmen, Drape agreed to talk about racing, the state of the game, and his coverage of it. Both Drape and the Times have been criticized in recent months for what some racing fans see as prejudiced coverage of the sport and a tendency to highlight what is wrong with racing while ignoring the sport’s more celebrated moments. Days before this year’s Belmont Stakes, the Times ran a piece in which Drape explored the lack of necropsies done in New York on horses that have died on the state’s racetracks, and criticism, particularly on the Internet, came fast and furious. Drape stands by the decision to write it, the decision to publish it, and the timing. “It’s astounding that the NTRA is out there accrediting the tracks for safety and no one’s done a necropsy in New York for decades. They’ve been mandatory in California since the mid-90’s. Now the Times’ primary racing writer, Drape didn’t begin his career as a sports journalist at the track; his original beat was college sports. Freelancing for the Times in Dallas in 1997, he did a story on the bush tracks of Louisiana; a year later he moved to New York to cover the college beat full-time. “Joe Durso was the racing writer and he was getting ready to retire. There’s a steep learning curve in writing about racing; you can’t just toss somebody in who doesn’t know anything about the sport. So I did second chair for the Charismatic story, and by 2000 the beat was mine. Even while racing was not a major part of Drape’s professional life, it still played an important role for him personally. Drape’s father, who is from the Hudson Valley, went to Saratoga frequently when he was growing up. As his father once brought Drape to the races, now Drape took his father to weekend excursions to the Spa. “I’d come up on Sundays and I’d take him to the track. We always had a great time there,” Drape recalled. “In 1997, we were on the roof of the press box, watching a turf race. My dad was going in for surgery in a few days. He looked at me and said, ‘I didn’t raise any bums.’ He had five kids, and he died 12 days later. It was his ‘ready to go’ moment. Discussion of the 2009 Horse of the Year reminds Drape of Invasor, 2006 Horse of the Year. “Before this year, Invasor was the best horse I had ever seen up close, the best horse I ever covered. I still think he’s under-appreciated. I always had the sense that he’d win, he was so professional. Drape acknowledges that one of racing’s fundamental challenges is being attractive and transparent to two widely disparate groups: the 30 million people identified as casual fans and the three million horseplayers who keep the game solvent. So what should racing do to address its problems? Drape offers two suggestions. “Less is more. We can’t race 365 days a year. I like the European model: festival meets for a few weeks or month; horses move around to different meets, then get turned out to be horses out for 3-4 months. And we should adopt international standards for drugs and medications. Joe Drape’s books on racing include American Black Maestro: The Epic Life of an American Legend, a biography of jockey Jimmy Winkfield; and The Race for the Triple Crown: Horses, High Stakes, and Eternal Hope. He edited a collection of New York Times articles about racing, To The Swift: Triple Crown Horses and Their Race for Glory. 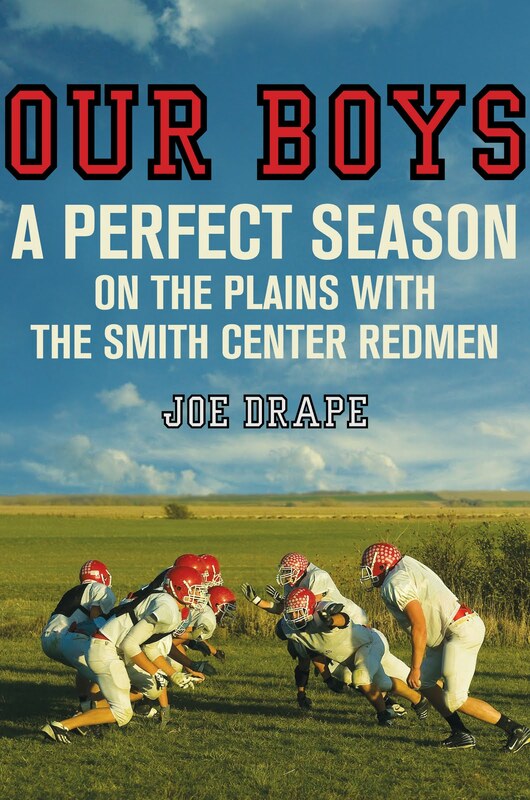 His most recent book is Our Boys: A Perfect Season on the Plains with the Smith Center Redmen. Glenn Altschuler reviewed the book for National Public Radio; you can also read an excerpt. More information about Our Boys can be found at Drape’s website. Wonderful post. While I might not always agree with Mr. Drape or the editorial position of The New York Times on every issue in racing, I have nothing but the utmost respect for his abilities as a journalist covering racing. I am keenly interested in what he has to say and I always am impressed by how thoughtfully he says it. Few racing writers grasp as insightfully the nuances of the world of horses and the training and racing Thoroughbreds. After following racing for more than 45 years, growing up attending the races at Saratoga, I've read the work of many of the best turf writers of the past half-century. In my view, Joe Drape's efforts rank right up there among very finest of them. Oops…and TKS–a very happy holiday to you! Thanks for all your comments…here's to more in 2010. As it would indeed be, QQ, given that Black Maestro and not American Maestro is the title! Thanks for such a tactful correction.And for the award info. Looking forward to writing about it in more depth next month. Great article. Joe and I are former colleagues, of sorts (I worked for the International Herald Tribune before starting training) and nobody loves the game more. I especially applaud his efforts to bring horse welfare and medication issues to light. There are other ways to race, and it's good that Joe writes about them. I have long thought the hallmark of a good journalist was to ask the hard questions and address the tough issues. Good 'newspapering' isn't a popularity contest. I do not always agree with him, but Drape is one of the best. I would like to thank Joe Drape for encouraging me to stop buying and reading the New York Times.I do occasionally miss the Crossword puzzle, but as Joe pointed out, I already have the Daily Racing Form for that need. I was listing to TVG waiting for AT THE RACES with STEVE BYK on my Sirius and the host ot the Handicapsule Program was giving tou some grief over INVASOR. You won"t get any from me. INVASOR overcame a bad jockey. I think it was more of his guts to win than the ride that got him to finish line. I can't wait for his babies! Great post.The CHRB takes the position that necropsy reports are confidential.http://www.thoroughbredtimes.com/national-news/2007/July/16/Jamgotchian-files-lawsuit-for-necropsy-reports.aspx It gets a little old that the CHRB hides behind statutes to justify keeping safety data secret rather than working to get the statutes amended. Thanks for the info BitPlayer, and to everyone else who stopped by to read and comment.Anon: thanks for adding a dissenting voice. Joe! Your book on American Pharaoh was terrific especially the portrayal of Zagat & my friend Bob Baffert. there was a few mis- prints that need some correction. On page 122 you gave Pioneerof The Nile’s yearling average in 2013 as $400,000 when it was $86,214 so not 20 times his average. My numbers are from the blood horse. In 2015 they were south of $200,000 after he had won the triple crown. On page 113 you said he worked a moderate half in 112.4 you meant 3 quarters not a half I hope. AP was a brilliant horse and Bob did a beautiful job training him and keeping control of Zayat . I purchased the book in Houston on last Tuesday and finished it at 5am Wednesday is how much I enjoyed it. Also I have been breeding to Pioneerof The Nile since he went to stud. As for AP even before the breeding season his fee was 2 mares for $100,000 each. Zayat has no clue! He is full of s—- as a Christmas turkey. Again you are an excellent writer just need to get a few facts corrected. I have bred to all the top stallions in KY. an after 40 years at Manchester Farm know what is going on. Your book did read like a novel which really made it fun to read. I went to the book store the next day and got 4 more books, 2 for my Farm Manager & assistant manager & 2 for horse friends. I also had a few horses with Baffert during the triple crown run and did watch the hold thing play out. You should come out with a second edition and make a few corrections. Mike G Rutherford, Manchester Farm, Lex KY. PS good luck at the derby!